We hear this comment from many patrons towards the end of our shift, just about everyday. Many times patrons and beach goers aren’t happy to be asked to exit the water. Is it a dumb rule? Since the establishment of Smith Point Lifeguards in July of 1959, there has never been a drowning within the protected bathing area when lifeguards were on duty. 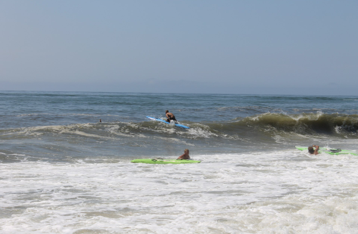 We want to educate Suffolk County Patrons that entering the Ocean with dangerous riptides, after hours, is strictly prohibited and not recommended. Asking patrons to exit the water at the end of our shift may seem trivial and inconsequential, but we don’t take this critical routine lightly. At 5:30 PM, the whistle blows, and all patrons within the bathing area are asked to exit the water. We want to make sure that we are leaving the beach safe at the end of our day. Patrons should not re-enter rough waters, once lifeguards are off duty. It may be very costly and heartbreaking mistake. Remember, always swim near a lifeguard.